Nearly 7 out of 10 UK businesses think they’re communicating with their customers effectively, while only 2 out of 10 customers agree. Here’s why. The rapid evolution of consumer lifestyle trends and technology have transformed the way businesses are expected to communicate. Millennial consumers prefer to communicate in ways that didn't exist five years ago, and businesses are expected to integrate with and be available on multiple channels, in order to keep customer communications consistent. We worked with Lawless Research to survey over 2,000 consumers and 867 businesses to understand how each group feels about the communications they encounter day-to-day. The research showed us, across the UK as well as the US and Australia, a major divide between businesses’ perceptions versus the real-world experience that consumers reported. Nearly 7 out of 10 businesses think they're communicating with their customers effectively, while only 2 in 10 consumers agree. The report also confirms the impact: poor customer communications are often correlated with poor performance of business KPIs like revenue and growth. Read below for a UK summary or download the full report for free. 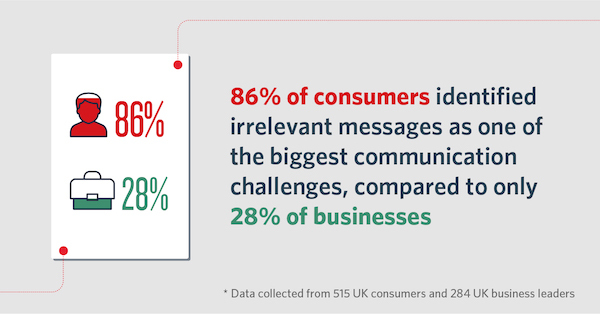 Our research found that, when it comes to connecting with customers, the majority of businesses are missing the mark. 83% of consumers say it’s often difficult to communicate with businesses. But, only 36% of businesses acknowledge these challenges. Companies tend to overestimate the value of their communication, misjudge consumer preferences, and underestimate consumer challenges. Our report found that over three quarters of consumers are frustrated with long wait times, too many steps to get answers, and slow responses. Yet for most channels, businesses greatly overrated the communication experience they offer. 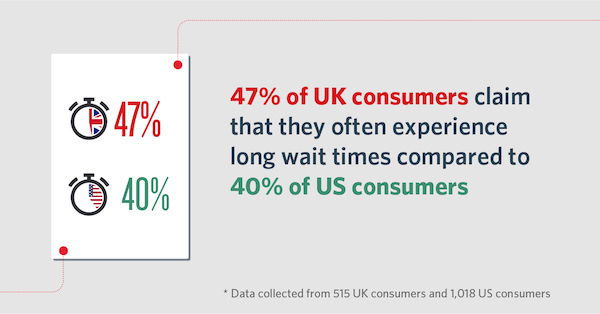 It's worse for UK consumers than their US counterparts, with 47% saying they often experience long wait times compared to 40% of US consumers. UK consumers are also more likely to be told to call back later due to high call volumes. 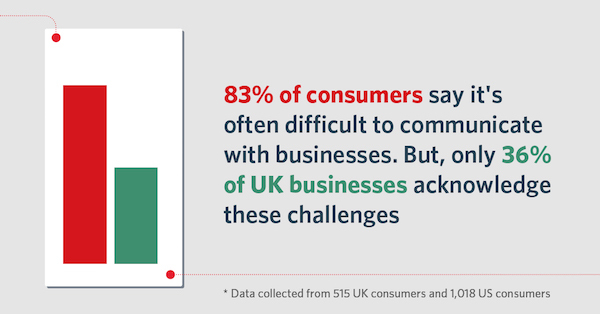 44% of UK consumers told us that they experience this often, compared to only 32% of US consumers. Consumers expect communication to be relevant, responsive, and through their preferred channel, but most businesses fail to understand this. Our research found that companies that measured positively for effective digital communications see an impact beyond high levels of customer engagement and loyalty; in fact, these companies see the positive results in revenue and profitability. Good customer communications are felt beyond individual customers. 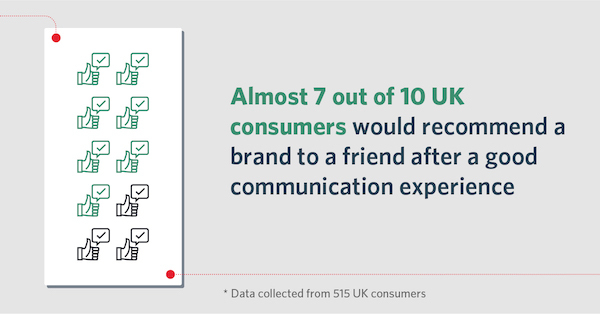 Almost 7 out of 10 UK consumers would recommend a brand to a friend after a good communication experience, demonstrating how good communications are essential for marketing and sales growth. 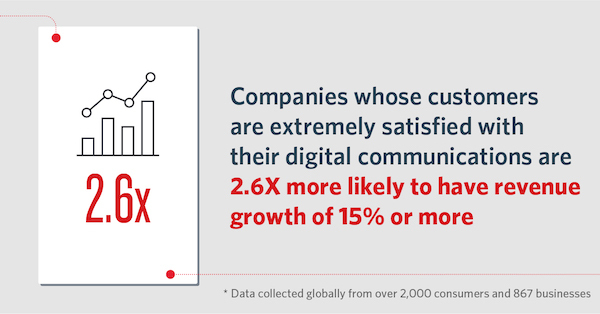 Companies whose customers are extremely satisfied with their digital communications are 2.6 times more likely to have revenue growth of 15% or more. There are clear gaps between generations about how they expect to communicate with your business. 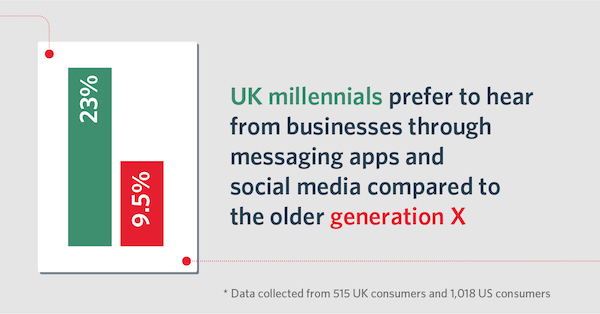 UK millennials are more likely to prefer interacting with companies by messenger apps and social media, two channels which didn’t exist for most businesses as recently as 10 years ago. 23% said they preferred these channels, compared to only 9.5% of the older Generation X. The potential negatives are also more extreme with consumers in these age groups. Both Gen Z and Millennials are more likely to tell a friend if they have a poor experience (79% for Gen Z compared to 61% of Baby Boomers) and they are also quicker to cancel an order or service off the back of a poor experience (44% compared with 29% of Baby Boomers). Our Bridging the Customer Communication Divide report found that consumers are clear: they want options. They want to communicate with businesses on the channels they prefer, and they want businesses to keep track of their shifting preferences. This can only be accomplished with an omnichannel communication strategy that provides consumers with an integrated customer experience. 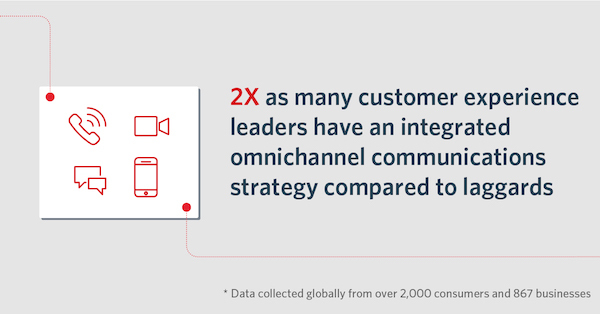 2 times as many customer experience leaders have an integrated omnichannel communications strategy compared to laggards. 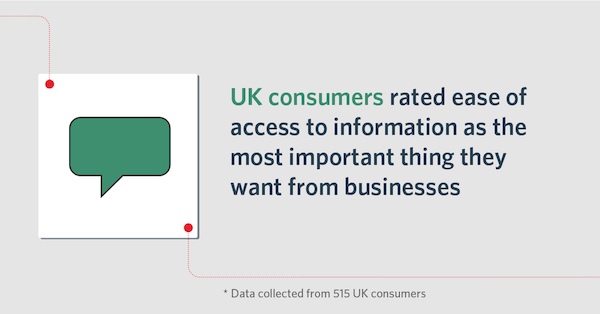 Our report found that one of the top reasons customers contact businesses is that they are seeking information such as account balance, hours of operation, or details about a product or service. Quick and easy access to this information is important to them. 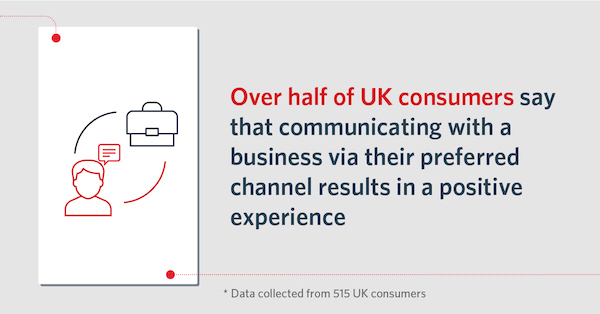 Over half of UK consumers say that communicating with a business via their preferred channel results in a positive experience. To support this, we found customer experience 'leaders' were 2.4 times more likely to offer all preferred communication channels to their customers, which contributes to their success. To see more global trends in customer communications, which communication practices consumers do (and don’t) like, and learn the one thing 97% of consumers said companies could do to earn more of their business, check out the full report here.